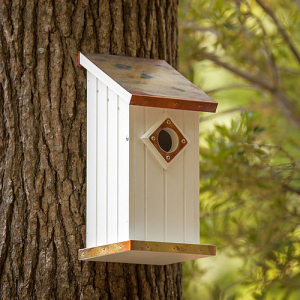 Our Fancy Home birdhouses and bird feeders are constructed of quality materials that are aesthetically designed to withstand harsh weather elements. The components are manufactured on a CNC router to ensure precision and quality. By using a combination of materials, such as cellular expanded PVC board (vinyl), copper, and liquid resins, we guarantee that the products we deliver will last a life time with little or no maintenance. You do not have to worry about rotting, splitting, and cracking. 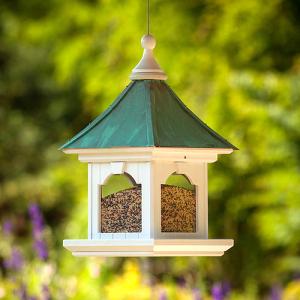 All birdhouses and feeders have removable roofs for easy cleaning. Fits on 4" x 4" vinyl sleeve post which fits over 3 1/2" x 3 1/2" pressure treated wood post. 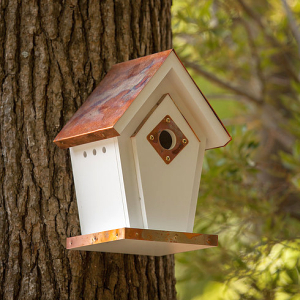 Our collection includes elegant handcrafted Dovecote Birdhouses, Blue Bird Birdhouses, Purple Martin Houses, Gazebo Bird Feeders, Church Birdhouses and Feeders. 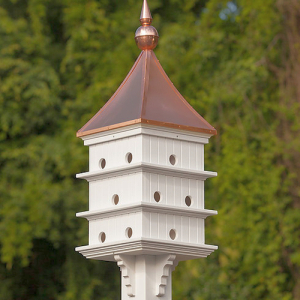 Choose from a variety of sizes and roof designs in solid Bright Copper, Patina Copper and Cypress Shingle. All proudly made in the USA!